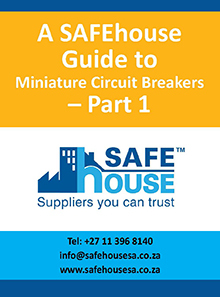 This illustrated guide explains what a miniature circuit breaker (MCB) does, what it consists of and how it works. It describes the typical internal construction of a thermal magnetic type MCB and gives an overview of the two technologies: thermal magnetic and hydraulic magnetic; what makes them work and why. The MCBs electrical characteristics – voltage rating, current rating, overload characteristics and breaking capacity – are described along with time delay curves and breaking capacity. Information that covers the required marking and information on MCBs is given along with a list of the applicable standards for MCBs.